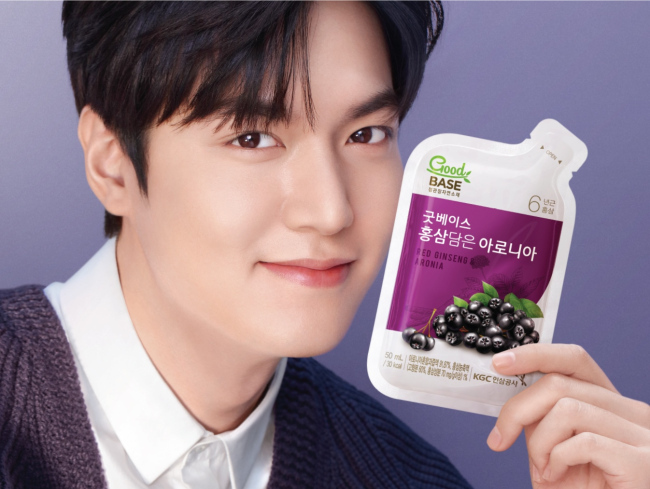 Since April 2016, Lee Min-ho has been an ambassador for state-run Korea Ginseng Corp.’s tonic product Good Base: Red Ginseng & Aronia. Now serving his compulsory military term, Lee has maintained his stint for a third year representing the company’s tonic with extracts of aronia berry, known as “king‘s berry” or “Europe’s equivalent to ginseng.” A KGC official explained that it is allowed by law to use promotional pictures taken prior to enlistment until the termination of a contract. The product, served in pouches, contains 1 percent of 6-year-old Korean red ginseng extract and 91.9 percent juice made from aronia berries imported from Poland. Good Base: Red Ginseng & Aronia is one of the alternatives to the KGC’s signature red ginseng tonic products, according to the firm. The firm said in a statement that the aronia-based tonic product could be an alternative to sugary juices or soft drinks.